A particular strength of our Neurooncology Clinical Trial Research Program is the conduct of innovative clinical trials providing our patients access to novel treatment concepts. The program encompasses first-line und salvage therapy trials across multiple tumor entities with a focus on malignant gliomas. Trials are done at all stages, from first-in-human studies until phase III therapy optimization trials, uni-center and international multicenter trials. The focus lies on investigator-initiated concepts in collaboration with local (NCT/DKTK), national (Neurooncology Working Group of the German cancer Society/NOA) and international study groups (European Organization for Research and Treatment of Cancer). We also strongly participate in pharmaceutical industry trials in order to provide a broad trial portfolio for our patients and to enable the center to join in the latest external developments. Members of our study team take internationally visible roles at all levels in international trial development. Importantly, the trial program is combined with interdisciplinary, comprehensive patient care for all neurooncology patients at an internationally recognized level and innovative translational research and biomarker development from tissue resources (together with the Institute of Neuropathology) and magnetic resonance imaging (MRI; together with the Department of Neuroradiology). Owing to the relevance of angiogenesis to malignant gliomas, the department has contributed significantly to large international trial activities (Wick J Clin Oncol 2010; Chinot, Wick NEJM 2014; Batchelor J Clin Oncol 2014; Wick Neuro Oncol 2015; Wick Clin Cancer Res 2016; Wick ASCO 2016). The Neurooncology and Brain Tumor Immunology CCUs have joined forces to develop the preclinical basis and the first-in-human clinical trial (NOA-16) with a peptide-based vaccine that targets mutant IDH in grade II-IV gliomas. The trial is coordinated by members of the Neurooncology Clinical Trial Research Group in collaboration with the NCT Trial Center and builds a role model of optimal use of central infrastructure and de-central patient-focused trial resources. In addition, we participate in a Novartis basket trial concept (study title: Advanced malignancies that harbor IDHR132 mutations) on IDH inhibition for hematological and solid tumors providing logistical support to the whole trial across several disciplines and disease entities. Within the framework of the DKFZ-Bayer Alliance, we have designed a trial concept for a novel inhibitor (BAY1436032), which has been jointly developed by the Heidelberg Neurooncology program (led by Andreas von Deimling, Neuropathology) and Bayer. This international, multidisciplinary trial in multiple solid tumors with the commonality of an IDH1 mutation is conducted by the Neurooncology trial group thus broadening our expertise and providing new opportunities and challenges for further trial structure development. The highlight topics for the future are the successful conduct of the new multicenter trials IMPROVE CODEL in anaplastic good prognosis gliomas and the N2M2 umbrella trial in newly diagnosed gliomas with unmethylated MGMT promotor (see figure). The scope - beyond the mere conduct of the intervention trial parts - will be the structured long-term follow up with a focus on patient-centered outcomes, the building of an integrated clinical data/tissue/imaging platform within the NCT Data ThereHouse and the co-development of patient-derived xenografts parallel to trials and structured routine treatments. The overall strategy of the department’s trial program will be the further improvement and harmonization of our trial infrastructure and procedures across different diseases as a prime trial site for collaboration partners. The NCT Neuro MASTER Match (N2M2) is an example for an umbrella trial including patients with the highest need for therapeutic progress in a modern trials design, using high-end molecular characterization, individualized therapy assignment and modern statistical adaptive designs to make the next big step in glioblastoma clinical research. Wick W, Gorlia T, Bady P, Platten M, van den Bent MJ, Taphoorn MJ, Steuve J, Brandes AA, Hamou MF, Wick A, Kosch M, Weller M, Stupp R, Roth P, Golfinopoulos V, Frenel JS, Campone M, Ricard D, Marosi C, Villa S, Weyerbrock A, Hopkins K, Homicsko K, Lhermitte B, Pesce G, Hegi ME. 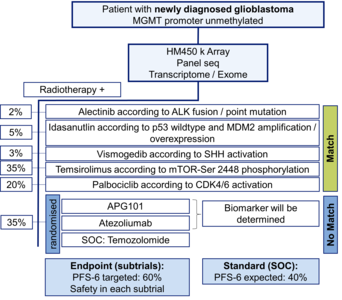 Phase II Study of Radiotherapy and Temsirolimus versus Radiochemotherapy with Temozolomide in Patients with Newly Diagnosed Glioblastoma without MGMT Promoter Hypermethylation (EORTC 26082). Clin Cancer Res. 2016;22(19):4797-4806.